The busy lives of Abby, her friends, family and neighbors in the idyllic suburban community of Evergreen are the focus in this series of early chapter books. 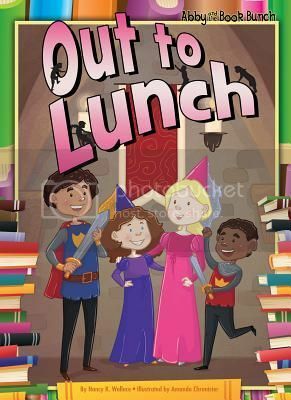 In Out to Lunch, Abby, her best friend Sydney and neighborhood boys Zachary and Dakota team up for a medieval project at school, creating knight and princess costumes with the help of their glitter-addicted librarian Mrs. Mackenzie. In The Mystery of the Golden Key, Abby discovers a beautiful key buried in her backyard, and after doing some research at the library, befriends the original owner of the key, Abigail Flynn, a 100-year-old nursing home resident. In Claim to Fame, Sydney is mortified when the boys play a trick on her, turning her blonde hair pink by sprinkling strawberry Kool-Aid on her while she’s at the pool. In the meantime, Abby’s nervousness over learning her lines for a play they are putting on at the library inspires her to change the show into a very successful puppet show. The series would benefit from clearer labeling as to the series order. Other titles in the series are listed alphabetically on the back cover and nothing on the spine or frontspiece indicates what order the books should be read in. Generously sized font, short chapters and a good number of greyscale digital cartoon illustrations make these a fast and fun read for young readers. Each book is appended with activity suggestions to extend some of the ideas presented in each title.